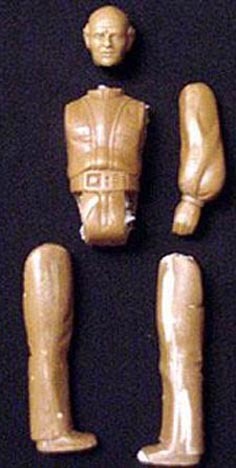 What we see here is an unpainted hardcopy of the Lobot action figure. Empire Strikes Back hardcopies are a lot more difficult to track down than Return of the Jedi hardcopies so to be able to land one of the coolest characters in the Trilogy is a real accomplishment. ;^) The first two shots shown are of the front and back of the figure. Take notice of the color of the figure. Since this is a pre-1981 action figure it was cast in a brown resin called Carbalon. 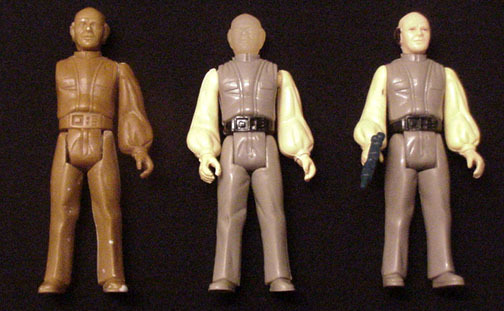 You'll also notice that poor Lobot has lost his right arm somewhere along the way. Currently it has no replacement if anybody can help Sandy finish this hardcopy please drop him an email. The next picture is of the hardcopy disassembled. Though it's hard to tell from this picture none of the limbs have been drilled or pinned. It's unsure why this figure was never fully pinned but it's possible that it was a back-up or it's also possible it was to be glued and used as a presentation at a later date. The final shot is of the run that Sandy is working on. From left to right is the unpainted hardcopy, a first shot with a clear head, and a production figure. Whatever the use was for this hardcopy it is a neat look into the creation of this figure and I thank Sandy for sharing.